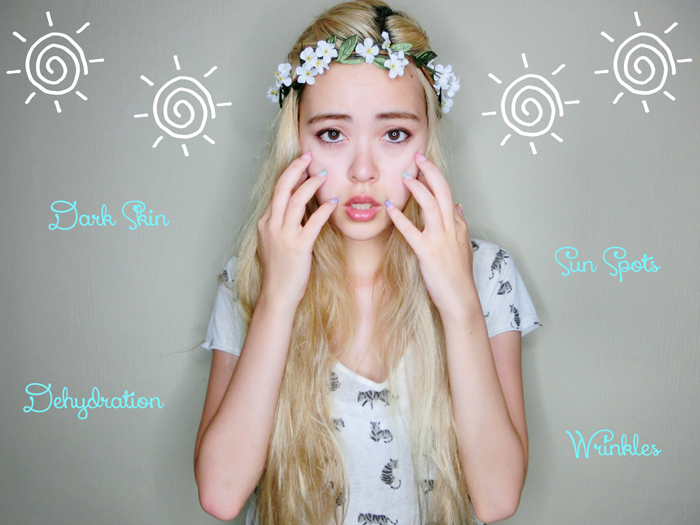 Living in a year-round sunny country like Singapore, we need to protect our skin from the harmful rays of the sun! In fact even if it doesn't seem sunny that day, UV rays can still damage your skin. With too much exposure to the sun you can face quite a few skin problems! The sun's rays can age your skin a lot, making it dryer & overall more tired-looking. Not to mention getting tanner! Biore sent me some very useful products for daily use & they came just in time as I've been needing to replace some of my skincare products! I previously never really got to try Biore products other than their makeup removal wipes, which are pretty popular! Particularly of interest is their new Biore Aqua Rich Whitening Cream! This cream is a sheer sunscreen with SPF 50+ PA+++ for daily use! I just got back from my summer trip to Europe! Aside from the usual summer sun, 2 of my destinations (Crete & Ibiza) were islands, meaning I spent a lot of time bumming at the beach! So yes, I actually made a very conscious effort to stay out of the sun! At beaches I would always take daybeds in the shade. Even out & about in town I would lug along a big sunhat! And while people might use sunscreen (helps you tan safely), I was using sunblock. With an SPF of 75. LOL. SPF 75 is like... the highest I've ever heard of so far hahaha. My 2 daily items against the sun! But that's how desperate I was to stay out of the sun! Spot the sunhat again... And me in the shade LOL. A daily sunblock with SPF 50+ PA+++ (which is super high, *whoop whoop*) would have been great! I had my sunblock, but like most sunblocks it's super thick & kinda icky to apply to the face. 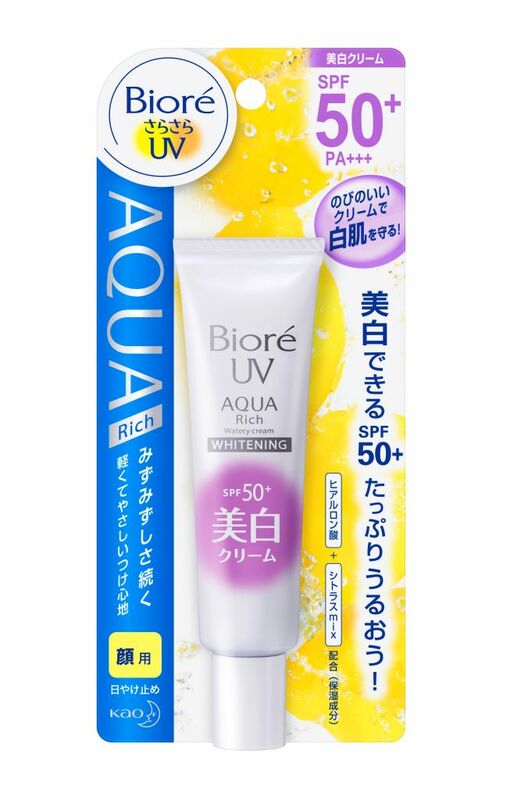 The Biore Aqua Rich Whitening Cream not only protects your skin from the sun with its SPF 50+ PA+++ protection, but also moisturizes & whitens your skin! So in terms of fairness, it both 1) prevents you from getting darker &) lightens your current skin tone over time! It contains natural extracts of Chamomile, allowing it to combat dark spots! At the same time the hyaluronic acid & citrus extracts in the cream help to hydrate & soften your skin. Easy application! Dab on a small dot on each area & slowly spread it! And done! The Biore Aqua Rich Whitening Cream is very light in texture & is instantly absorbed so it doesn't feel like anything is on your skin! It can also be used as a makeup base, all while protecting & nourishing your skin! 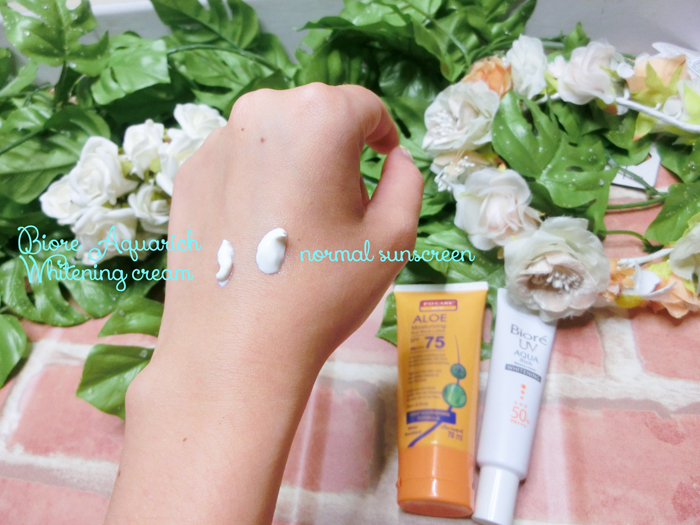 Below are some comparisons of texture between the Biore cream & my previous sunblock! This is after a few quick wipes! The Biore Aqua Rich Whitening cream is noticeably thinner. Do you recall the last time you applied sunscreen/sunblock & how ridiculously thick it feels? Ugh. The Biore Aqua Rich Whitening cream is instantly absorbed due to its water capsule technology, which makes it feel like water on skin! It's easy to spread on your skin due to its watery texture. My previous sunscreen/sunblock in contrast, doesn't get absorbed at all & remains a thick mess. 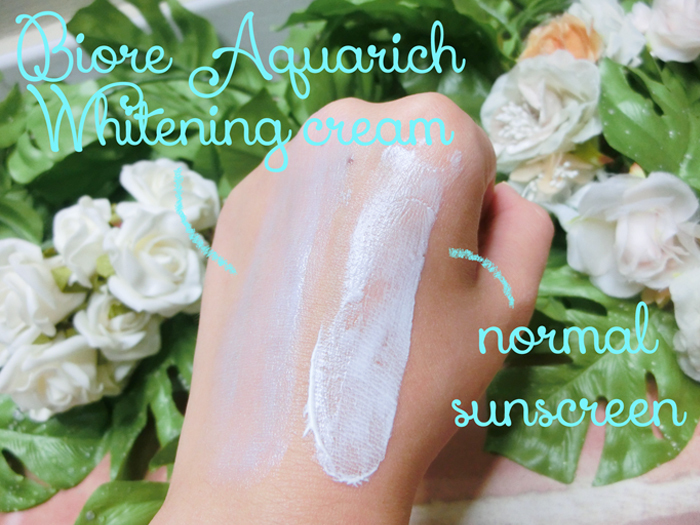 With the Biore Aqua Rich Whitening cream you don't have to worry about exposure to the sun! 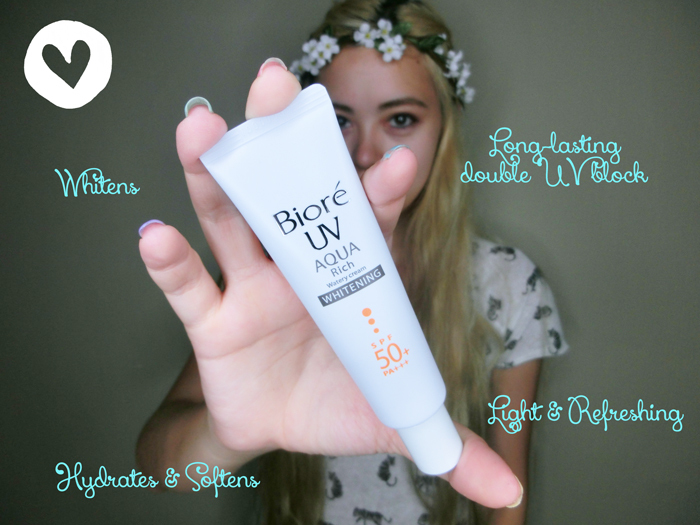 While moisturizing is important, protection from UV rays is equally so! I never really bothered when I was younger since I had the huh-I'm-not-going-tanning-what mentality, but in reality you need to protect your skin from the sun on a daily basis, not just when you intend to be outdoors a lot. No more excuses for leaving your skin defenseless! Also tried out the other Biore products sent to me! The Biore makeup wipes are already pretty popular & I have previously purchased them before! On a daily basis you should use a normal makeup remover (such as their Aqua Jelly makeup remover), but this is really convenient for short overseas trips, makeup removal/touchup on-the-go & so on! 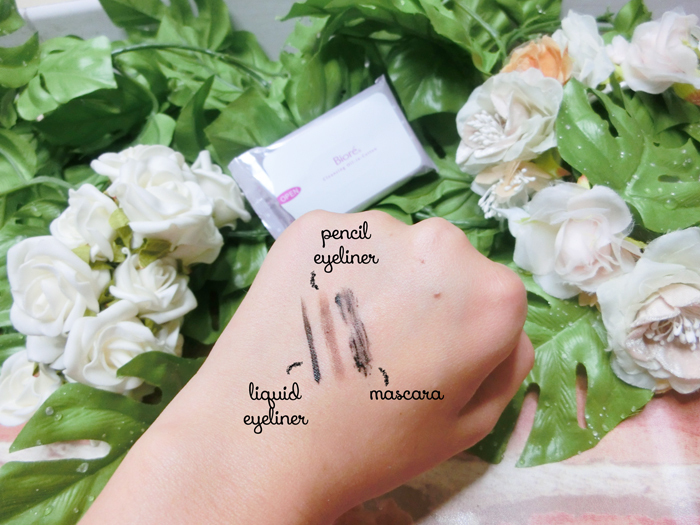 Tested it out against some common makeup items that tend to be more resilient when washing! For daily usage, try the Biore Aqua Jelly makeup remover! It has a really unique jelly-like texture & requires NO cotton pads/wipes! Simply massage on gently to dissolve the makeup, & rinse off! Super convenient! 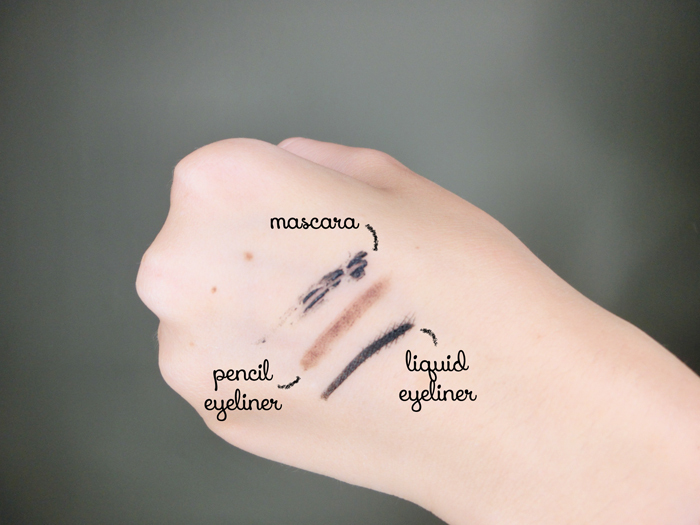 Wiping off the left side of my makeup now! You can see some of the dissolved makeup, which comes off immediately when I rinse my face! 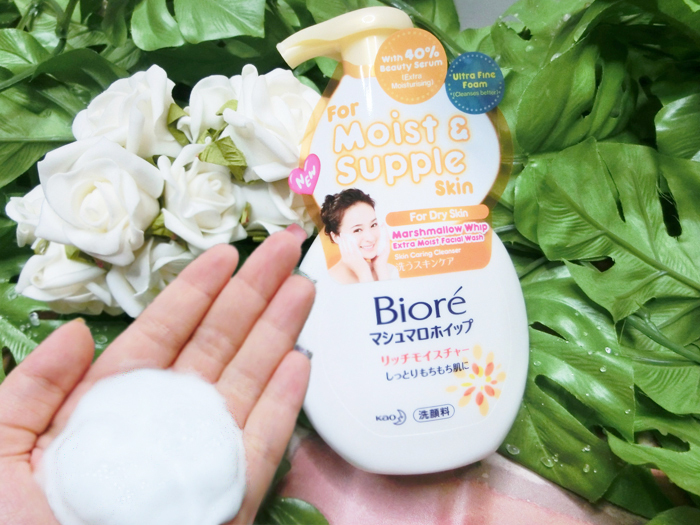 After removing your makeup, remember to wash your face with the Biore Marshmallow Whip facial wash! This one is extra moist; targeted at dry skin & that's great for me! I have combination skin but my cheeks can get really, really dry & overall I have more of a dry-skin issue than oily. It's really super bouncy & fluffy! Quite fun to play with haha. Available at all major pharmacies & supermarkets! By the way, did you know that Biore is the number 1 UV brand in Japan? Their products targeted at UV protection are really popular among Japanese women! P.S. 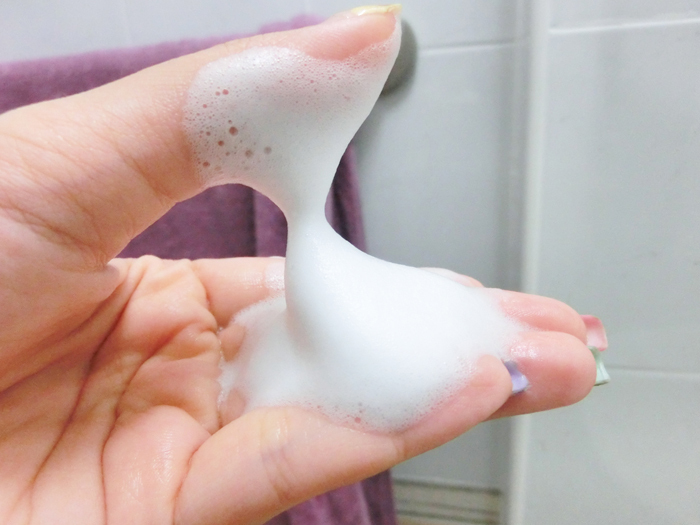 When applying the Biore Aqua Rich Whitening cream, remember apply some to your neck & ear tips as well! These are commonly neglected areas that face a lot of sun damage!